Esports Stadium Arlington (TX), the largest gaming and esports events facility in North America, celebrated its grand opening with FACEIT’s Esports Championship Series Season 6 Finals, a $750,000 prize pool tournament scheduled to coincide with Thanksgiving Weekend offering esports enthusiasts a new fan experience to complement the iconic football festivities of the season. Located in the heart of Arlington’s entertainment district, Esports Stadium Arlington is a $10-million, 100,000 square-foot facility built to serve the unique and technologically advanced demands of the esports industry. Designed by award-winning architectural firm Populous and brought to life with build partner Shawmut Design and Construction, the stadium features a competition space with a built-in 85 feet-long LED wall that’s accompanied by an immersive sound and theatrical lighting system. A first-of-its-kind production facility equipped with Grass Valley systems will power event broadcasts, complete with a dedicated observer room, caster studio, data center, and control room. Players will be able to stay on top of their game by utilizing the dedicated Team Area which includes eight “Team Rooms,“ a space for players to strategize and practice, a “Player Lounge“ where players can relax and socialize as well as spaces created specifically for media and staff. transforming previously underutilized space of the Arlington Convention Center, Esports Stadium Arlington also showcases the adaptive re-use potential of esports. 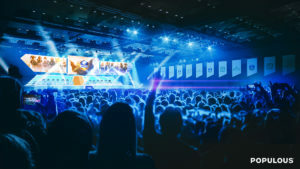 The planned stadium will feature a major competition event space, gaming, retail, and social spaces, VIP hospitality, a broadcast studio, and team training areas.